Independent market research firm IHS has published its new Microwave Network Strategies and Vendor Leadership report titled, Global Service Provider Survey, which highlights operators’ perceptions of microwave equipment suppliers. The report, surveyed a significant global sample of operators, representing 23 percent of 2016 worldwide telecom capex. 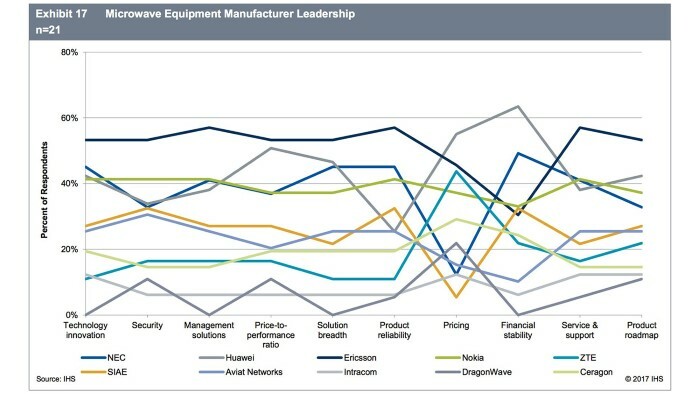 This year, 67 percent of respondents named Ericsson as the top microwave manufacturer, ten points ahead of the closest competitor in the category. 62 percent of respondents said they currently had Ericsson microwave equipment installed in their network. On top of this, 90 percent of service providers had a familiarity with Ericsson microwave offerings, more than any other supplier. 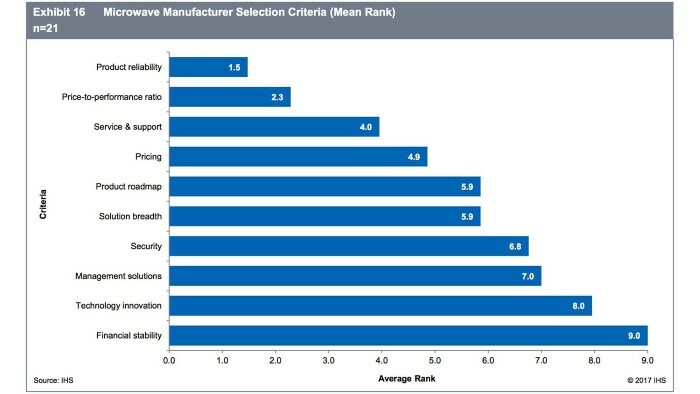 Most importantly, respondents ranked ten criteria for selecting microwave manufacturers. In order of importance, the criteria are: product reliability, price-to-performance ratio, service and support, pricing, product roadmap, solution breadth, security, management solutions, technology innovation, and financial stability. Prepared by Richard Webb, Research Director, Mobile Backhaul and Small Cells, IHS Markit, the report recognizes Ericsson as a long-term pioneer of microwave. As the industry looks toward 5G, microwave technology will continue to play a key role, securing mobile broadband backhaul capacity. Microwave is a very flexible technology and already today supports 10Gbps data rates and very low latencies. An attractive option for growth of backhaul capacity and speed is the availability of microwave spectrum and products for higher frequencies, resulting in strong interest in the industry for E-band products, operating on radio frequencies around 70 to 80GHz. These and other exciting developments were part of the discussion at the fourth annual Global Microwave Meeting hosted by Ericsson on June 27 to 28 in Gothenburg, Sweden. Experts from the private and public sector, industry and academia discussed the critical role and technical evolution of microwave networks, which enables to push the technology to progress across the industry.